Reality testing: Multiple Myeloma (MM) is a chronic condition characterized by a variety of fluctuating symptoms. With so many issues and treatments to remember, it can be difficult, over time, for patients to keep track of their symptoms, medications, and appointments. Envisioning a new reality: Develop a user-friendly digital app that enables patients to organize all of their information pertaining to MM, allowing for simplified management of their condition and enabling them to take a more active role in determining the most effective ways to address their needs. Inventing the reality: Track My Multiple Myeloma™ is a comprehensive disease management app targeted specifically to MM patients and their caregivers. 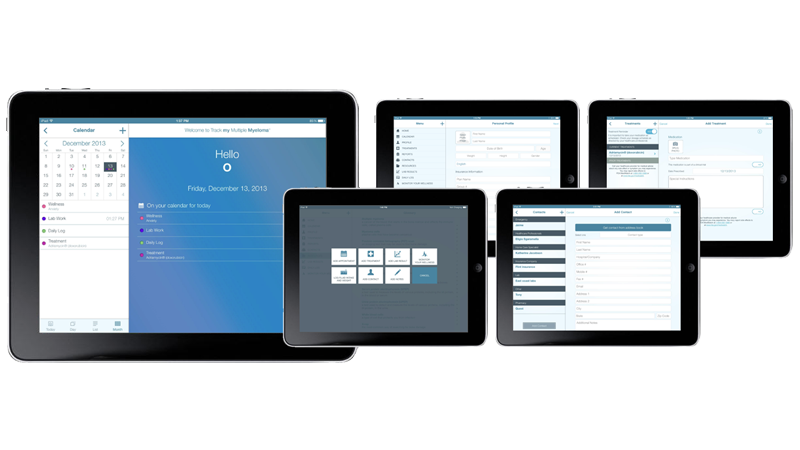 Intuitive features allow patients to easily log pertinent information regarding MM, such as a diary to track symptoms, a notes section to facilitate important discussions with healthcare teams, contact information, and appointment reminders. A resource for patient support and advocacy groups, Track My Multiple Myeloma provides up-to-date information on MM and supports patients though the management of their condition by helping maintain accurate, accessible records of symptoms and medications so that their treatment plans can be adjusted appropriately. Patients receive more targeted treatment by utilizing tools to track symptoms, set medication reminders, and take notes to monitor their experience. Designed to make effective use of the larger screen, the app is user-friendly, making it easy to simultaneously input information while reviewing previous entries. 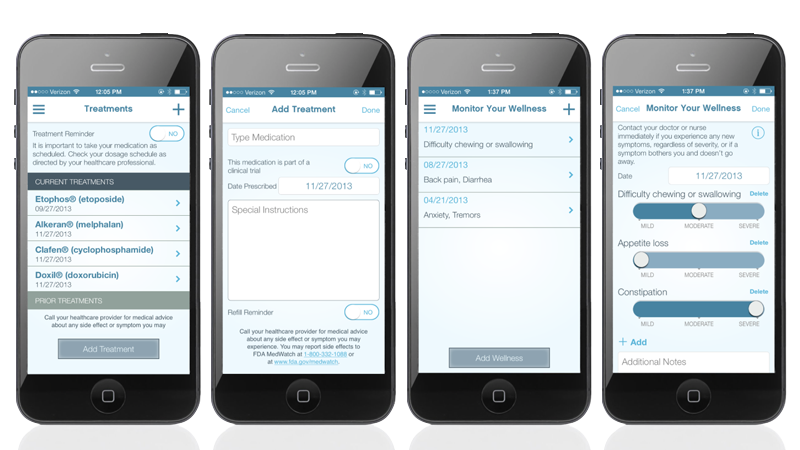 Patients can log pertinent treatment information, including a diary to track symptoms, notes to facilitate discussions with HCPs, contact information, and appointment and treatment reminders. iPad is a registered trademark of Apple Inc. Track My Multiple Myeloma is a trademark of Celgene Corporation. Reality testing: Multiple Myeloma (MM) is a chronic condition characterized by a variety of fluctuating symptoms. With so many issues to be conscious of and so many treatments to remember, it can be difficult, over time, for patients to keep track of their symptoms, medications, and appointments. Envisioning a new reality: Develop a user-friendly digital app that enables patients to organize all of their information pertaining to MM, so that they can simplify the management of their condition and take a more active role in determining the most effective ways to address their specific needs. Inventing the reality: Track My Multiple Myeloma™ is a comprehensive disease management app targeted specifically to MM patients and their caregivers. 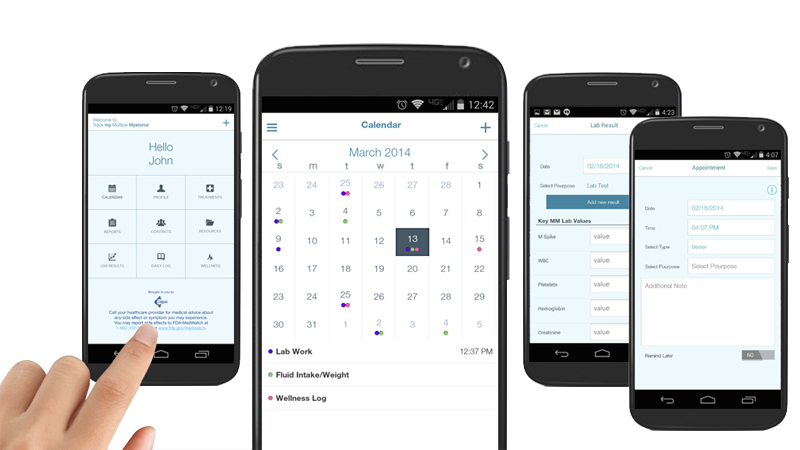 Intuitive features allow patients to easily log pertinent information regarding MM, such as a diary to track symptoms, a notes section to facilitate important discussions with healthcare teams, contact information, and appointment reminders. A resource for patient support and advocacy groups, Track My Multiple Myeloma™ provides up-to-date information on MM and supports patients though the management of their condition by helping maintain accurate, accessible records of symptoms and medications so that their treatment plans can be adjusted appropriately. Drawing upon extensive digital expertise and a keen understanding of communications in the healthcare marketplace, REALITYRx has created over 40 interactive apps that support patients, professionals, and providers, and set brands apart as Track My Multiple Myeloma™ has done for Celgene. Check out Track My Multiple Myeloma™ in the iTunes® App Store and Google PlayTM.